Whether you produce a few pieces of art a year or several hundred, you can display your artwork like galleries and framing studios do. The Mini-Wrap Shrink Packager is designed to produce a perfect seal with a PTFE-coated bar, not a hot wire. This makes it safer, more reliable, and much less expensive than other shrink packagers. It professionally seals in seconds, using archival quality, high clarity shrink film. Once sealed, artwork has a tough, glass-like protection that will last for years, yet is easy to remove. Each unit includes a sealer and stand, a film dispenser, and a 115V, 1500 watt, 60 Hz heat gun to shrink the film after sealing. Mini-Wrap 12 — This sealer measures 12" long and requires 115V. The Milwaukee Heat Gun is included. Mini-Wrap 17 — This sealer measures 17" long. It requires 115V and 150W. The Milwaukee Heat Gun is included. Mini-Wrap 31 — This sealer measures 31" long. It requires 115V and 300W. The Milwaukee Heat Gun is included. The Mini-Wrap Shrink Packager is perfect for any artist who packs and ships paintings, prints, or photographs. In contrast with Handi-Seal, it is designed specifically for use with archival quality polyolefin films. 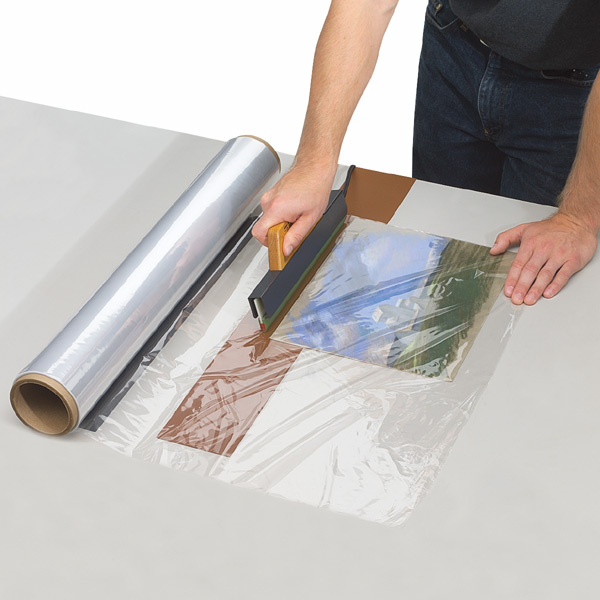 Archival grade shrink-wrap films are recommended with photographs or fine art, especially if the work is likely to be left in the shrink wrap packaging for an extended period of time.